Add fashionable styling and light to your outdoor living area. All seaside lamps feature all resin construction with heavy weighted bases for outdoor environments. Lamps are completely weatherproof and have a two level dimming switch and weatherproof cord and plug, 12 ft. on the floor lamps and 16 ft. on table lamps. Unbreakable poly carbonate waterproof light bulb enclosure allows the use of a standard 100 watt light bulb. Floor lamps are 60" tall and table lamps are 34" tall. 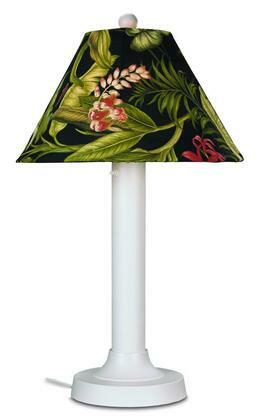 Floor lamp and table lamp Sunbrella shades are 7 1/2" x 11 1/2" x 20". Great product which arrived at my doorstep a quickly after I placed my order. Great seller!